I'm an open advocate of DC already a supporting member. We have a number of BWB on the committee organizing DC 17 (Arlington Bill and. Makhtobanabi to name two) They have a great committee with lots of experience (they do Capclave yearly). It's fairly easy for everyone to travel to DC as it has a major airport there. Who do you advocate and why. I am torn because I want to support the DC bid because of awesome people. But on the other hand I would prefer that it not be in the US three years in a row like that. And I want to go to Helsinki. That's nearer to my place. To be honest DC is a driveable trip for me. I still prefer DC on the merits. By not going to panels during the day? LOL. Worked for me in San Antonio and I saw lots of the sights there during WorldCon. Did con activities in the late afternoon/evening. But seriously for Helsinki, I would just go over early and/or stay later. I have a friend that lives there that would take me around. Can't supporting members vote on site selection? Remember there are also the Montreal and Japan bids for 2017. Definitely Helsinki as I would actually go to that lol. You're right. You can pay the "Advanced Selection Fee" and vote remotely. The fee will be converted into a supporting membership for the 2017 Worldcon. Per the Loncon site. Which is easier, generally, to travel too DC or Helsinki? Helsinki. Always wanted to go to that part of the world and it's cheaper and I would have more of chance to get there. If DC wins there's just no way in hell. I'd very much like to fly to DC, but then I'll be beginning saving money for that trip from now on. And yeah, I know it's three years ahead. I was so ... disappointed when I learned that I wouldn't be able to attend WorldCon this year. Due to my work. More seriously, I much prefer the Euro Worldcons - more diversity, less generic than the US ones I've been to. Plus, the Helsinki party had lots of different flavours of vodka, while all DC had was a non-alcoholic punch. The DC crew will do a hell of a job with this Con. Give them the opportunity to do it . The demon alcohol doesn't appeal to me. In fact, I'm not a heavy drinker when it comes to parties. I'm usually the one who does the driving. Helsinki. We missed our chance with London even though we had vowed to go because of a series of unforeseen expenses and mistakes. 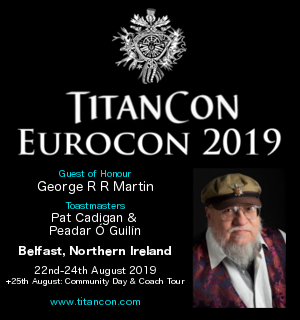 There is no way we can make a US con, having one in Europe is a lot more doable. The Monsters will be 6 years old by then, leaving them with someone will be a lot easier. Whoever wins in 2017, you can always come to Dublin 2019.